Mor Kulambu, an integral part of Tamil cuisine, was one of the first dishes that I learned to make and incorporate into our menu when I got married and started to cook. 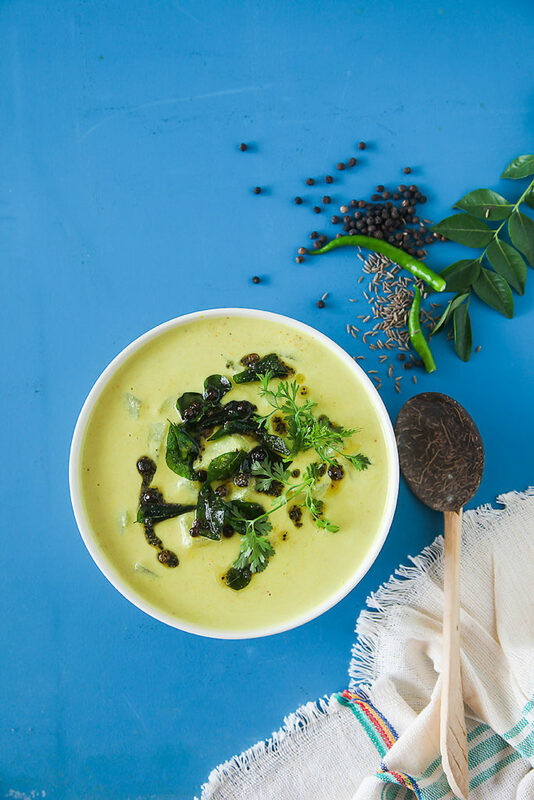 Paldya- its Kannadiga counterpart is not something I favoured while growing up, but I was surprised with the taste of this dish that arises from the combination of simple fresh and dry spices like ginger, chili, coriander, cumin and peppercorns. The yogurt provides a perfect base for the spices to mingle and shine. Mor Kulambu was also a part of the cooling summer menu I developed for the BBC Good Food a few years ago. I usually love making mor kulambu with ash gourd (petha) or white pumpkin but today in its absence, I used the Madras Cucumber with great success. This is a dish where you can include other vegetables like okra, yellow pumpkin, drumstick, peas and potato. Although you can eat this through the year, this dish is particularly nice in the summers depending on your choice of vegetables. Since ash gourd is particularly cooling it is apt for the hot season. A simple vegetable stir fry along with this kulambu and rice makes for a simple, wholesome and satisfying meal. I often make red rice with this kulambu but love it with white rice as well. When you cook traditional recipes like this, you become the carrier of a legacy and a culture spanning thousands of years. You recreate memories and relive the food habits of people from a bygone era. In this day and age, it's nice to know and cook simple dishes that will have you spend little time in the kitchen. This dish requires a little extra effort in terms of getting the ingredients together and grinding the spices which is fairly simple too. Make this dish If you want to explore complex flavours that take you back to another time and remind you or make you imagine about grandmothers cooking and feeding their families with dishes like this, down south. It’s always nice to explore food through our history, cuture and traditions, isnt it? If you make this dish, do tag me and use the hashtag divinetasterecipe on Instagram, Facebook and Twitter. 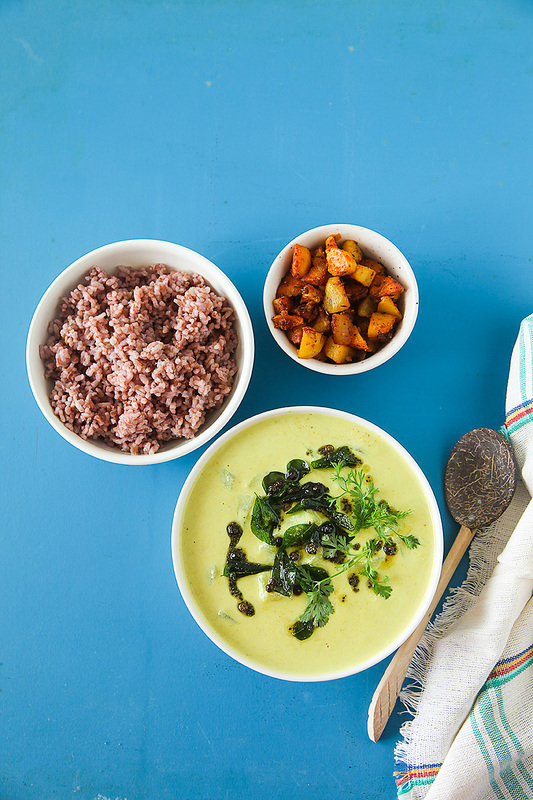 Buttermilk stew with ginger, chili, coriander and cumin. Wash and soak the dals and rice in water for about 30 minutes to an hour. Peel and chop the vegetables and keep aside. In a pan cover the vegetables half way through with water and bring to a boil. In a blender put in the coconut, chillies, coriander and cumin seeds and ginger along with the soaked and drained dals and rice. Add about ½ a cup of water and grind to a smooth paste. Put the yogurt in a bowl and with a whisk beat until the yogurt is smooth and there are no lumps. Mix in the ground paste and the turmeric into the yogurt. In a wok or pan put in the vegetables, the yogurt mixture and water*. Mix well and bring to a boil on low heat, stirring all the while. Add the salt. In a seasoning pot or a small wok, put in the oil. After the oil is hot, add the mustard seeds. When they pop, put in the peppercorns, curry leaves and asafetida powder. Turn off the heat and mix the seasoning into the boling kulambu. At times, I start with the seasoning and add the vegetables and water into the seasoning and allow it to cook and proceed with the next steps. I also like to add fenugreek or methi seeds into the seasoning. You can use any vegetables to make this. If using vegetables like okra or eggplant, stir fry the vegetables and allow them to cook nicely before adding into the yogurt mixture. Adjust the consistency of the water as desired. Some prefer a thinner consistency but I prefer a thicker consistency. Thank you for a lovely recipe. What happens to the soaked dals and rice? What's the purpose of the soaked dals and rice? Where have you used them? They need to be ground with the coconut and spices. Kindly read the updated recipe again. Sorry for the omission.